There are those times when you’re in a bit of a hurry. You’ve got only a limited amount of time to eat lunch before heading off to your next destination, and you can’t be spending a lot of time with an elaborate meal. This is exactly where the sandwich comes in. Sandwiches are quick. They are generally self-contained and not too messy (although I can think of some particular exceptions, like the French dip and the Italian beef). 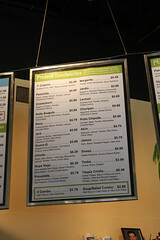 And the the world of sandwiches has a lot of options. To me, two of the best options for a quick sandwich on the fly are the Cuban sandwich (or simply, a “Cubano”), and the Vietnamese Banh Mi. In this case, I was in the mood for a Cubano. Roasted pork and ham served on a Cuban-style French roll (slightly more airy and less crusty than a traditional French baquette), with cheese and pickle, all pressed and toasted to perfection. I always like a good Cuban sandwich, although my travels don’t often take me to a place where I can indulge (a quick check of the blog shows my last review on a place featuring Cuban sandwiches was Puerto Sagua back in 2008…). But on this particular trip to Chicago, my hotel (the Congress Plaza Hotel, which I recommend for it’s economical room rates, but don’t particularly recommend for it’s modernity or good upkeep) was kitty corner from one of the better-rated Cuban sandwich joints in downtown Chicago: Cafecito. 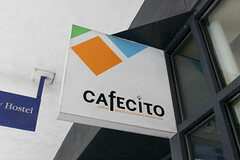 Nestled into a small storefront off the lobby of a large international hostel on Congress Parkway, Cafecito basically specializes in two things: Cuban style coffee (cafecito, where the place gets it’s name), and a rather large menu of Cuban-style sandwiches. In addition to their house specialty, the Cubano, they’ve also got a variety of variants on the Cubano theme, from Cuban (they offer a Ropa Vieja sandwich, which Carol opted for), from Argentinian (the Chimichurri), from Caribbean (Jerked Chicken), and from even Italy (the Margherita). They’ve even got a nod to Elvis with the Elveez (plantains and peanut butter). 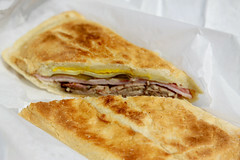 Looking over the menu, I opted to stay classic with the Cubano, while Carol opted for the Ropa Vieja. After a few minutes, they wrapped our sandwiches and we took them over to Grant Park for quick lunch. How was my Cubano? Well, it had everything I expect from a good Cuban sandwich. Pork that’s tender and not dry. Ham that’s moist and not too salty. A nice layer of cheese, some tangy pickles, and a little bit of mustard, all nestled into a perfectly toasted Cuban-style baguette that’s fluffy on the inside, and just the right amount of crusty on the outside, and this was a thoroughly enjoyable little sandwich. Carol rather enjoyed her Roja Vieja as well, the meat and tender and not too stringy, the sauce tangy, and the sandwich nicely assembled. Overall, a thoroughly good rendition of a Cuban sandwich, and one of the better quick lunch spots I’ve found inside the loop.